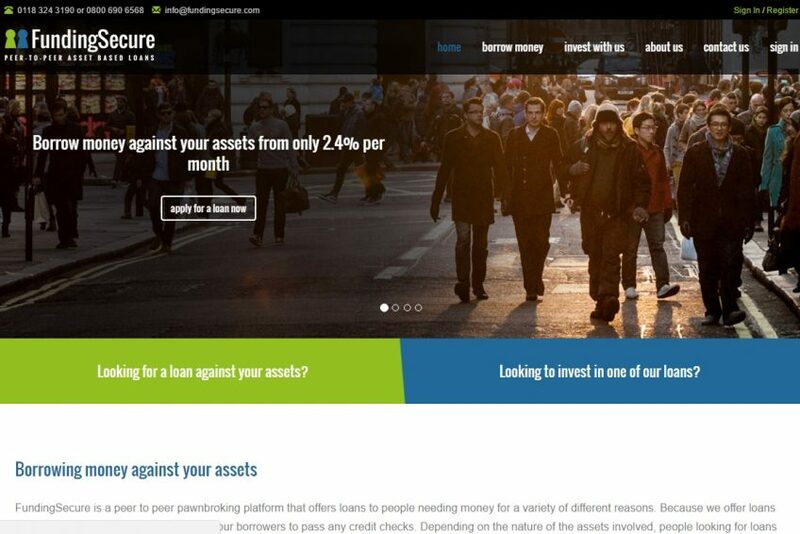 Funding Secure is a peer-to-peer lending platform which specialises in secured loans. By providing finance against the personal assets of borrowers (‘pawn loans’ or against property) investors have means to reclaim capital in the event of a default. Investors receive returns in the range of 9% to 13% per annum whilst borrowers pay a representative APR of 35.4%. Most loans are for 6 months and may either repay without penalty at any time or renew at end of term. Some loans have cashback offers and bonuses for large investments of up to 4% above the standard returns for general investors. Sell Out: Yes, secondary market with discounting. Speed of Investment: Fast through secondary market & new loans daily. Funding Secure ISA: Not yet. CAUTION: When buying a loan part you are purchasing the original loan. In line with HMRC rules you will therefore be responsible for any tax liability on all interest paid when the loan completes. As this can result in an overall loss, especially if the loan is repaid early, you should bear this in mind when purchasing on the secondary market. This means that both interest and capital are paid only at the end of term. So, when you buy a loan on the secondary market you are also taking the tax liability of the previously accrued interest. Some new investors do not fully understand this and get caught out buying all the ‘generously’ discounted loan-parts on the secondary market with a few days left to run. Tempted by the allure of an 11.2% net return, I decided to try Funding Secure out nevertheless. I’m really happy I did, as it has grown on me to become one of my favourite platforms and one of my largest investments. At first, my plan was to get around the problem of additional tax liabilities by just buying new loans on the primary market or almost new loans on the secondary market. Over time, as I began to invest more time in understanding the platform I’ve changed this strategy a little (more on this further down the review). Deposits are made via a bank transfer. My last transfer took about 30 minutes to show up in my account, but another time when I transferred late at night it did not appear until the next morning. Bank transfers seem to be manual, and if you are desperate to make a quick deposit you can ask the person on the live chat to check it for you. Make sure that you add a ‘deposit tracker’ (link) as well as just doing the transfer from your bank. So, if you are prepared to invest £100,000 you’d get a massive 16% return on a first charge secured investment with a low loan-to-value! The bonus is paid at loan completion. To make it harder to game the system, you don’t get paid for bonus amounts sold on the secondary market. For the slowest shifting loans they sometimes add an additional cashback, this is paid to all investors (even if you invest just £25) and paid once the loan is fully funded. After all of these incentives, if a loan still cannot be fully funded then occasionally underwriters are brought in to complete the funding. The ‘B’ sign means there are bonuses for larger investments (usually starting at £5k+) and the ‘£’ sign means there is a cashback (usually 1% for all investors). That 98% funded loan at the bottom of the screenshot above has them both. So, someone investing £25 for 6 months would get 13% interest and 1% cashback (annualised to 15.6% interest). Someone investing £100,000 would get 13% interest, 1% cashback and 4% bonus interest (annualised to 19.9% interest). I take a skim of the valuation, if it looks reasonable and the LTV is less than 70% I usually try to get a piece of the loan. I am more likely to lend to something like gold jewellery or a car that I think can be easily resold, and less likely to lend on an expensive painting (that may be more niche). Returns are usually 12% and without cashback or bonus incentives. Sometimes you have to be incredibly quick to buy these as the most popular can sell in a minute or two. In MoneyThing, to shave a few seconds off a new loan release you can go to the pending loan preview and keep refreshing the particular loan preview until it is released. I’ve lost out trying to replicate tactic that on FundingSecure, as it seems the loan preview is separate and you have to wait until a new page is created within ‘Loans needing Investment’. Property loans usually linger for a lot longer on the primary market and you won’t need to worry about similar ‘fastest finger first’ bidding tactics. I prefer smaller residential properties that I think could be easily resold if the loan goes into default. Like the example from the last screenshot above, there are some very large property redevelopments that come with higher return incentives and I try to not get carried away by that. To help me decide what to invest in I look at the size of the loan and the speed that others are taking up the investment. I use the speed of the investment takeup as a weak proxy indicator for due diligence. If others are investing really quickly then I look in more detail at the details and security valuation. After several months of using the site I started to buy late term loans on the secondary market. I’ve published an online calculator here to give an idea of what the net return of buying a secondary market loan is. The initial example set in my calculator is someone buying £100 of a 13% 183 day loan, at 1% discount after 87 days. I’ve also added a 0.7% haircut to price in default losses. The result of this calculation is that someone on a 40% marginal tax rate would get net interest of 4.02% for the remainder of the loan, as opposed to 7.69% if they had bought it new. On the other hand, someone who pays 0% marginal tax would get a net effective rate of 13.64% as opposed to 12.82% if they had bought it new. However, what I really struggled when making the calculator was how to price in the increased risk of defaults from buying later term loans, so I’ve broken out a live breakdown working of the calculation at the bottom of the calculator. What is the security and LTV? I am more cautious with late term loans. Was there originally a cashback? A 1% discount on the secondary market looks less generous if the previous owner already recieved that 1%. How many people are trying to get rid of that loan? If its several people offering large amounts then perhaps one will cut their price even more as time runs out. Loans are removed from the secondary market 30 days before their end of term. As for selling loans, it is more complicated and you may need to offer large discounts for a quick sale (e.g. 1% or more for a property loan towards end of term). On the upside, if you are a tax payer you can reduce some of your tax this way. To work out what you need to sell at, go to the secondary market page, filter on the loan reference, and look at the existing discounts offered for that loan. I have managed to sell non-property loans at a premium on the secondary market, it appears some people are willing to pay a little extra to avoid the ‘fastest finger first’ bidding! Gross interest currently averages at 12.7% and they estimate after defaults this should come down to a still very encouraging 11.2% per annum. There’s no provision fund, but since the loans are secured against property or other assets at there is a way to reclaim losses against bad debt. Funding Secure’s statistics as of December 2016 show that of the £80+ million loaned out, less than £16,000 of capital was lost through defaults. 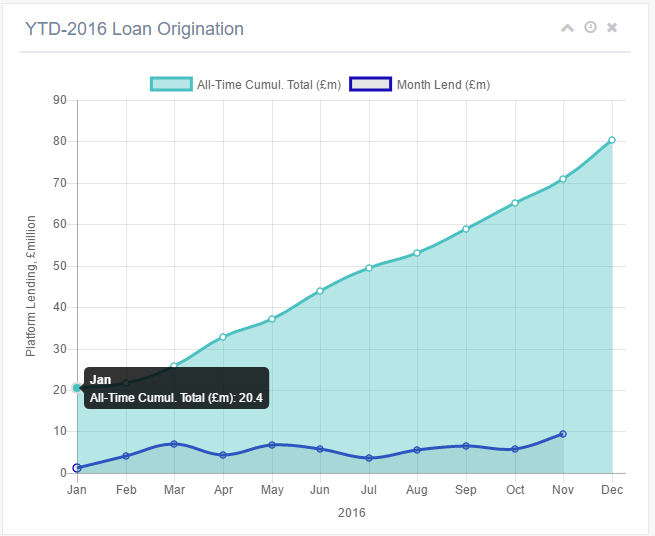 However, as I showed in the loan origination chart above, Funding Secures growth during 2016 has been astronomical and many loans are yet to reach their repayment date. So we don’t yet know what default rates on a significant proportion of the loan book will look like. I like to check my P2P accounts now and again to get a snapshot of my total investments. However, Funding Secure has one quirk that really had me scratching my head! For borrowers they have a minimum charge of the first month’s interest. This means that whether a borrower pays back on the first or the last day of the month it’s the same interest. So, when as an investor you go to ‘My Current Investments’ tab, the ‘Interest To Date’ field similarly has the entire first month’s interest from day 0. It only starts to tick up on a daily basis after the first month. However, if you sell the loan-part on the secondary market you still only get paid the accrued interest by number of days held. I’ve written up a walk-through on how to get around this problem: ‘Reconciling your Funding Secure Account History‘. Unfortunately this was written before the recent website upgrade (December 21st 2016) so may need some tweaking. Overall, I’d recommend Funding Secure to more experienced investors with an appetite for manual investing on higher risk, secured loans. I’d spend some time getting to grips with the rules for buying older loan parts on the secondary market, and pay attention to the details on some of the largest property based investments. Also, I’d resist the temptation to invest too much in high return property loans until we get more feedback on defaults from loans made during mid-late 2016. The referral bonus of £25 is a nice sweetener too, but not as attractive as others offering £50 or £100. You are an active investor in Funding Secure or have been in the last 6 months. I found this a great platform to use for the first year after starting Q2 2016, 11% returns on most of my loans all paid back on time or within a few months. But I am yet to have a single loan paid back since September 2017, only one has defaulted and many are well over 2 months over due with no comments on why or when they will be repaid. Up until this year I was sat on 10% profit but things could go either way this year, down to 2% or up to 11%, I am now starting to question the stability of this investment and looking at similar sites to see if this is more stable else where. Funding Secure is not for the risk-averse! Of the 139 loan parts I have, 35 are late. That means that they should have been repaid by now, but haven't been. If that sort of thing would give you sleepless nights, think carefully whether you really want to lend on this platform. To date, though, none of my loans have defaulted and that means that loans that were late in the past did get repaid, with full interest to date of repayment. Where others see downsides in the secondary market, I see opportunities! OK, To recap, the person receiving the interest pays tax on all the interest, not just the interest accrued from when they bought the loan on the secondary market. In other words, sellers typically realise a capital gain and can amass total capital gains of £11,000 a year (or whatever the current CGT allowance is) without paying capital gains tax. For non-taxpayers (or people lending from their IFISA), the tax treatment has no effect on them and by buying loans at a discount, they can get some great returns. I recently analysed all the loan parts I bought that have since been repaid and the average annualised return from them is a stupendous 15.60%. Yes, you read that right: over 15% per annum!!! What concerns me more than a little, though, today, 15 November 2017, is the "unscheduled maintenance" on fundingsecure.com, ie you can't login to your account, which means that I have absolutely no idea what's going on with my investments! Thanks for a comprehensive review. Are you aware of any other platforms with secondary markets that pay interest and capital on completion? I’m sure some bot could profit from this arbitrage for a zero/higher rate tax payer pair! Funding Secure is the only one that I know of, I would not be surprised if a number of people already have some tools set up to profit from this. One difficult thing is understanding the additional default risk in buying the end of term loans: as soon as you have some that repay late or default it will cut into the buyer returns. Goingbto join this so may as well use your referral. Whats your user name so I can list you. Having recently done my homework and read many on-line reviews (including this review by Neil), I decided to try P to P investment, I did quite a bit of research on the different companies offering P to P and the nuts and bolts as to how they work.. FundingSecure seemed to have a good track record with good internet reviews. I opened an account a few weeks ago, and to date everything appears to be fine, and there are regular email updates. The platform is generally quite easy to navigate and to understand, however the only bit I’m not quite clear on is buying and selling on the secondary market as I have my FundingSecure account in an IF ISA. I’m not yet sure as to the tax situation. 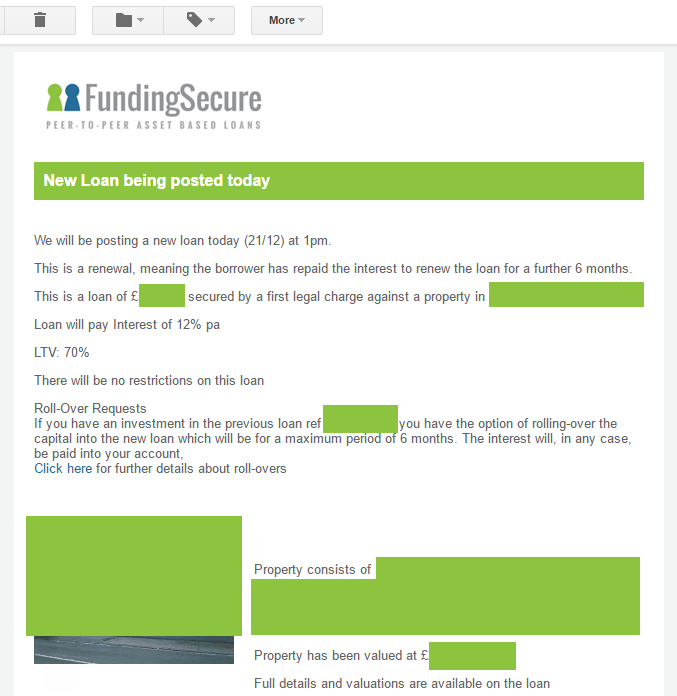 For the time being I am quite happy to place my hard earned £££ into what appears to be a constant flow of “new” loans. In summary …. So far so good with no problems, (time will no doubt tell) !! To answer Davey M …you have no liability to capital gains tax nor income tax on gains made inside an ISA or IFISA. The potential CGT referred to will only apply to those with non-ISA accounts and then only if they exceed their annual CGT allowance – somewhere around £11000 when I last checked. So you’d have to be going some (investing huge sums) to exceed that! For the investor inside the IFISA wrapper, it can be completely ignored.